May 2014 Mini Event Recaps! It has been a busy month, so I haven’t written as much as I’d have liked to. Here are a few small recaps of events I have been to over the last few weeks. 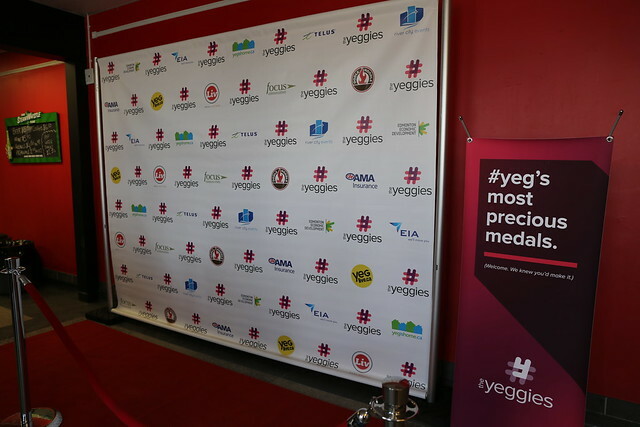 On May 9, local content producers were celebrated in Edmonton at the second annual Edmonton New Media Awards, affectionately known as The Yeggies. I was thrilled to be a part of the organizing committee for this year and had fun helping to put on a successful show! It was great to see many familiar online faces in person to recognize the work of their peers. Congratulations to all of the nominees and winners! You can see more photos of the event here. Also check out Lincoln’s video recap here. I volunteered to be a mentor in the 2014 spring edition of the popular interVivos Mentorship Program. The pairing event took place on May 14. With a speed-dating format, each protege got to spend four minutes with each mentor. At the end of the event, everyone wrote down their top 5 choices. The interVivos folks have since paired us up, and each mentor and protege will meet at least three times over the course of the program. I have emceed the last couple of pairing events, so it was interesting to be on the other side this time! It’s amazing how quickly four minutes goes by. It felt like you had just barely gotten through introductions before time was up and the protege was moving on to the next mentor! I know I am not the most experienced mentor, but I have had the good fortune of learning from some incredible Edmontonians over the last few years, and I’m looking forward to paying that forward. I was fortunate enough to receive a media pass for a session at Host Edmonton, which took place from May 22 through May 24 at the Shaw Conference Centre. I decided to attend the afternoon keynote on Friday called “Taking Risks and Setting the Table for the Future” with chef Marc Murphy. I didn’t know what to expect from the session – it turned out to be the story of how Marc got to where he is today. No slides or visuals, just Marc talking. He credited much of his success to having dyslexia, as it forced him to work hard and be willing to take risks. Another key message was, “you can’t be afraid of starting over and picking up the pieces.” Marc started over numerous times throughout his career, learning and growing along the way. As he was telling the story, I found myself wishing we had checked out one of his restaurants when were in New York! Next time. This was Marc’s first time to Canada, and he seemed to be enjoying Edmonton when I asked him what he thought so far! I hope the other guests felt the same way and left Edmonton with a positive feeling. I am still unclear about who exactly Host Edmonton was meant for: those in the hospitality industry, foodies, or both? Attendance certainly didn’t match the expectations I had for the event given the high quality marketing and branding. A tighter program and clearer messaging for next year’s event would both be positive changes. And possibly even some different price points. Great to see EEDC experimenting with some new approaches and initiatives, however! On Saturday, May 24 we held our first What the Truck?! event of the season. 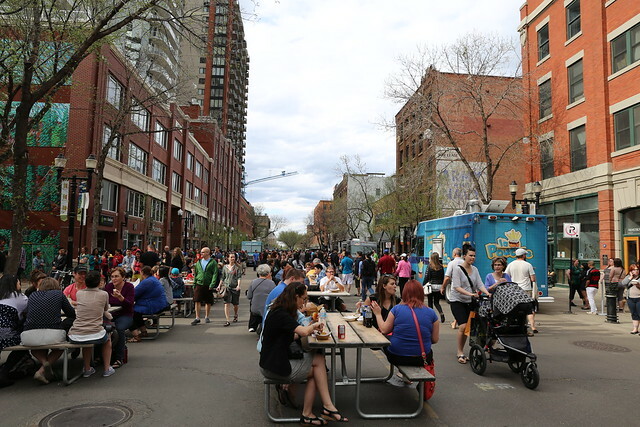 It took place on 104 Street from 5-9pm and featured 12 trucks. I think it’s safe to say the event was a success – perhaps too successful, as the lineups were quite long that night! I myself spent nearly an hour in the line for S’WICH, but it was worth it. We know the lineups were long, and while we’re working to have more trucks on hand for our next event, lines cannot be entirely avoided. On the plus side, it was great to see so many people chatting and enjoying the sense of community that comes with one of our events. I was also pleased to hear that downtown restaurants and businesses benefited greatly from the crowds we were able to attract into the area! You can check out more of my photos from the event here (and more from Dave here). Save the date for our second event of the season: Friday, June 13 in Old Strathcona from 5-9pm! Last night I attended the 11th annual RISE Awards, courtesy of the Edmonton Mennonite Centre for Newcomers. The gala event took place at the Edmonton Expo Centre and featured a fancy stage setup by Production World (they seem to be at every event lately!). The program went quite long, but featured some great entertainment and an inspiring keynote by Zahra Al-Harazi. It was also fun to see former mayor Stephen Mandel enjoying himself up on stage! Tonight, along with journalist, rapper, and cat-lover Omar Mouallem, I am hosting a poverty simulation with the United Way. 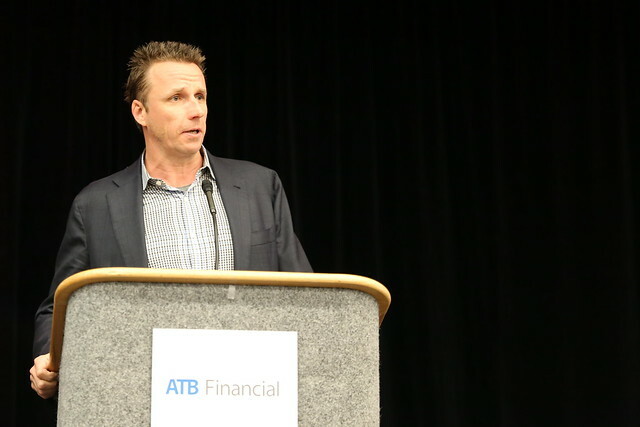 I attended the first one in Edmonton back in November 2012 and found it highly educational, so I was thrilled to be asked by the United Way to encourage other young Edmontonians to participate. As you may know there is now a Mayor’s Task Force for the Elimination of Poverty in Edmonton, so I think this is a great time to be getting others involved. This weekend I am attending the Good 100, “an annual two day gathering that brings together a diverse group of 100 Edmontonians involved in good work in their communities.” The event takes place at Rundle Park and sounds like it’s going to be an intense but rewarding couple of days. I’m looking forward to meeting some new people and to learning about some interesting local projects! On Monday I’m doing a session at the 66th annual IPAC National Conference. IPAC is the Institute of Public Administration of Canada, and my session is entitled Sparking the City’s Creativity with Technology. I’m looking forward to sharing some of the interesting things happening here in Edmonton with public administrators from around the country! There are so many other exciting events coming up, you can tell that we’re into the summer swing of things now.